Bernard “Barney” Fetzer founded Hopland-based Fetzer Vineyards in 1968. Fetzer died in 1981 and eleven years later his widow and eleven children sold the family business to Brown-Forman Corp., the Louisville owner of Jack Daniel’s. Chilean wine producer Viña Concha y Toro S.A. acquired the company from Brown-Forman in 2011. Throughout its history, Fetzer Vineyards has been active in sustainability and ecological causes. In 2004, its president was a vocal supporter of a measure to ban genetically modified organisms in Mendocino County, the first jurisdiction in the nation to eradicate the cultivation, distribution and production of GMOs. In 2014, Fetzer Vineyards was certified zero waste and, the next year, it became the largest vineyard in the world to garner the B Corp designation. Fetzer Vineyards is the largest organic wine grape grower in the U.S. certified by California Certified Organic Farmers. It has 960 acres of organic vineyards in Mendocino County, which include 260 acres of biodynamic vineyards certified by Demeter Association. 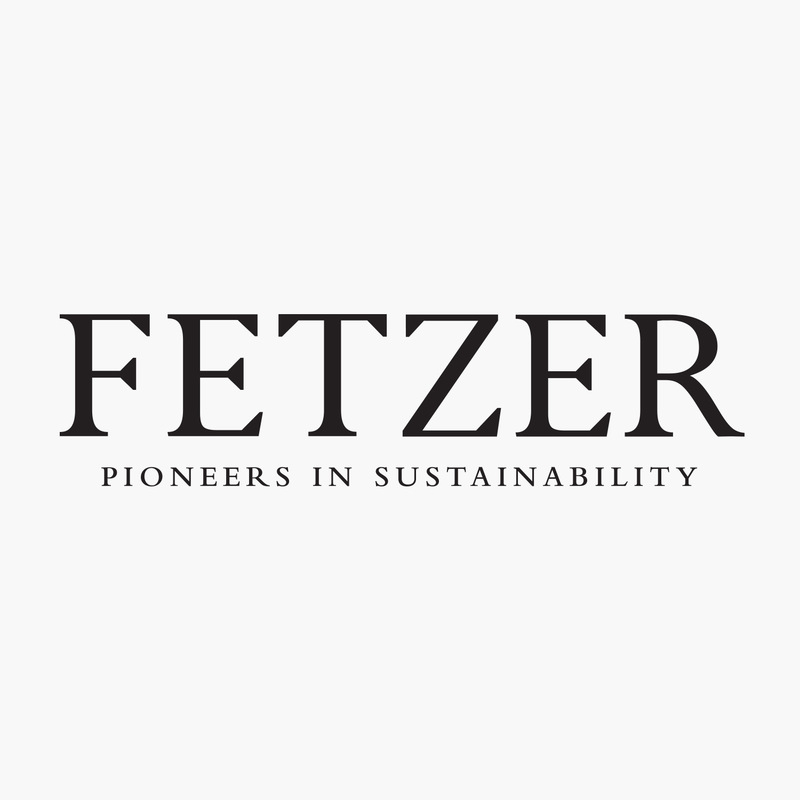 Fetzer is a top-five US premium wine brand with a commitment to 100% of its grape suppliers being certified sustainable by 2020. Fetzer Vineyards makes wines under the Bonterra label from its organic grapes. Fetzer Vineyards has taken big strides toward diminishing its negative effects on the environment, but the company is pushing further. Its goal is to become net positive by 2030. “We’re committed to putting more back into the world than we take out, resulting in a positive corporate footprint. We need to strive to not just reduce our negative impacts, but to completely eliminate them and begin actively creating positive impacts in the natural world and in our communities,” explains Josh Prigge, director of regenerative development for Fetzer in a video on the winery’s website. To reach its lofty goal, Fetzer must take hard steps to implement initiatives that go well beyond base-level stewardship practices. Over the last quarter century, Fetzer has reduced its waste by roughly 97 percent. In 2015, its diversion rate was 99.1 percent. 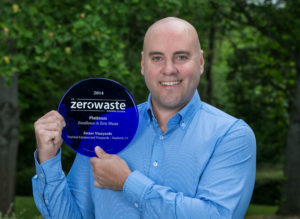 “Where we really excelled was eliminating waste from the supply chain. You have a lot less control over what other companies are doing,” said Prigge. 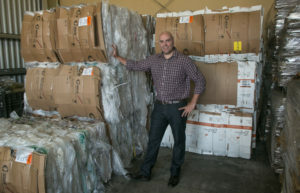 He emphasized that Fetzer stressed to its vendors the importance the company puts on jettisoning waste, and figured out methods of partnering with its vendors to minimize packaging and reuse materials. For example, Fetzer ships the palettes its glass provider uses back to the provider, and the provider uses them again and again. In a second example, Prigge detailed, “We have airbags that we fill up with air when we ship our product, and those get broken down and sent back to us. We have really found that suppliers have been more than happy to work with us once they are aware of our goals and sustainability values.” Additional waste reduction measures include composting grape skins, stems and seeds on site, locating mixed-stream recycle bins throughout its buildings, and reselling used wine barrels and barrel racks. Fetzer Vineyards also adheres to conscientious water usage practices. Following installation of an innovative new wastewater treatment process in late 2016, Fetzer Vineyards will begin to reuse wastewater in its winery and in the vineyards. The BIDA® system from Chilean company BioFiltro will leverage the digestive power of red worms and microbes to naturally filter up to 99% of the winery’s wastewater. The system, which replaces energy-intensive aeration ponds, will use approximately 85% less energy than Fetzer Vineyards’ current wastewater treatment program. A byproduct – worm castings – will be harvested twice annually to use as fertilizer in vineyards. Drip systems irrigate all the vineyards (with the exception of one old vineyard that remains sprinkler-irrigated) which allows Fetzer Vineyards to water vines uniformly across its acreage. One water conservation technique Fetzer Vineyards has found valuable is adjusting pruning schedules so vines have less exposure to frost and, therefore, require less water. “Holding back on winter pruning until spring when the vines start to push delays bud break, which ultimately reduces the frost risk,” said Fetzer Vineyards’ vineyard director Ben Byczynski. Even more impactful in saving water is avoiding heat cooling, a process involving watering the vineyards with sprinklers when the temperatures rise to 102 degrees and above. “As a farmer, watching the weather is critical. We’ve noted that irrigating when going into a heat spell reduces heat summation, and the vines can weather the heat quite well,” said Byczynski. Fetzer Vineyards is going on its sixth year of incorporating grazing sheep into its vineyards for weed control and soil fertilization. Initially, the sheep grazed the winery’s vineyards that are certified biodynamic, but their role has now expanded across the entire vineyard operation. Byczynski outlined that they arrive in the winter when the vines are dormant and rotate through the vineyards twice. “Using sheep is a great way to reduce the mechanical footprint in the vineyard while enhancing biodiversity, and the manure deposits increase the microbial population, creating heathier soils. The sheep add life to the vineyard when it’s asleep…Bringing life and energy during the dormant period,” he said. Fetzer Vineyards also cultivates biodiversity by trying not to harm beneficial insects. “Anything that we can do in the vineyards to increase the presence of beneficial insects is key. If we can achieve a balance of pests and natural predators without affecting quality and yield then it’s a win-win situation.” said Byczynski. Sheep have another benefit: they decrease greenhouse gas emissions. Byczynski estimated they spare Fetzer Vineyards 3,000 to 4,000 gallons of diesel fuel annually. “We don’t use the tractors for three passes through the vineyards for under-vine weeding. We use sheep instead,” he said. In 1999, Fetzer Vineyards became the first winery in the state to be fueled solely by renewable energy. That year, it installed a 40 kilowatt-hour solar panel array on its administrative building. In 2006, Fetzer Vineyards substantially increased its solar capacity by affixing 4,300 panels atop of its barrel room and warehouse that have the potential to generate 1.1 mWh per year. Moreover, Fetzer Vineyards sequesters carbon and protects natural resources by maintaining natural oak woodlands and riparian habitat on about 45 percent of its land, and by nurturing cover crops to remove the need for synthetic chemicals. Fetzer Vineyards has also worked hard to address erosion. 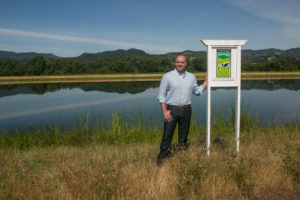 With assistance from Fish Friendly Farming, it developed a sediment control plan for its vineyards. Byczynski said, “Maintaining health and balance in the vineyard is important, but it’s crucial to look at what we do in the field and how it impacts the watershed and the surrounding habitat. As organic farmers, we know there is a delicate balance in nature and everything is related. So for us, protecting and allowing the fish and wildlife to flourish will allow us to ensure the longevity of our ranches.” He expounded that Fetzer Vineyards staff keeps a close watch on creek water flows and water usage from ponds. “We are constantly taking stock of our surroundings, and we do our diligence to reduce the impact of water usage on stream and river flows,” said Byczynski. During the drought, he continued, the Farm Bureau and Fish Friendly Farming set up an online reporting tool to record when water was going to be diverted from the nearby river the day before it was diverted. “This is a good example of how working together can pay off by saving water,” said Byczynski. Fetzer Vineyards’ goal is to divert 99.9 percent of its solid waste by 2016. To edge its diversion rate upward, Prigge says that every material Fetzer Vineyards employees use has to be carefully considered. “It is about behavior change and really educating everyone that they need to be thinking at all times to get that last .9 percent or .8 percent,” he said. In 2016, Fetzer Vineyards became a CarbonNeutral® company, becoming the first U.S. winery certified CarbonNeutral by Natural Capital Partners. By 2020, it expects to reduce energy usage by 20 percent, water usage at its Mendocino County winery by 15 percent and be wholly served by grape suppliers that are certified sustainable. Fetzer Vineyards reports to several organizations that monitor its various programs. Among those organizations are U.S. Zero Waste Business Council (USZWBC), The Climate Registry and B Lab, a non-profit that establishes standards for B Corp certifications. In 2013, the USZWBC validated that Fetzer Vineyards diverted 2,807 tons of total waste from landfills in 2013, which is equal to the weight of 1,400 cars. Prigge told a KKFX morning news program that Fetzer Vineyards has been tracking and reducing its waste since 1990. The operation has been tackling greenhouse gas emissions since 2005, when it started reporting its emissions to The Climate Registry, and has reduced them by more than 50 percent. For years, Fetzer Vineyards has tracked its water usage. “Consistently walking your vineyards, knowing your soils and utilizing the plant stress and moisture sensors all play into deciding when and how much to irrigate. We measure all the variables with precision in mind,” said Byczynski. Every two to three years, soil samples are checked to gauge nutrients. Fetzer Vineyards stated it employs organic soil amendments such as fish emulsion when the samples reveal they are necessary. Measuring inputs and outputs is obviously important, but Prigge noted it’s difficult to measure the effect a commitment to sustainability has on the minds and hearts of Fetzer Vineyards’ employees and hopeful employees. “People want to work for a company that is not all about maximizing profit,” he said. “People want to work for a company that shares their values and their beliefs, where they are part of something more. They know that sustainability is a core value here.